The topic for Week 23 in Amy Coffin’s and Geneablogger’s 52 Weeks of Personal Genealogy and History series is Books. What was your favorite book, or who was your favorite author from your childhood? What do you like to read now? Books or other formats? This is the topic I’ve been waiting for all year…books have been my passion, and a source of delight and sometimes envy all my life. However I admit that as I’m just emerging from two weeks of cataloguing and (mostly) packing up my library, both family history and general, in preparation for new carpets and paint, I’m feeling a little less enthused about the hundreds of books I have. Mind you, it’s a case of be careful what you wish for: as a child I was soooo envious of a neighbour’s glass-doored book case complete with aged books. With a book in your hand, you’re never at a loss for inspiration. A birthday or Christmas without a book would definitely have been a disappointment. Remember those compilation books: the Girls Own Annual and the like which were around a lot “back when”? 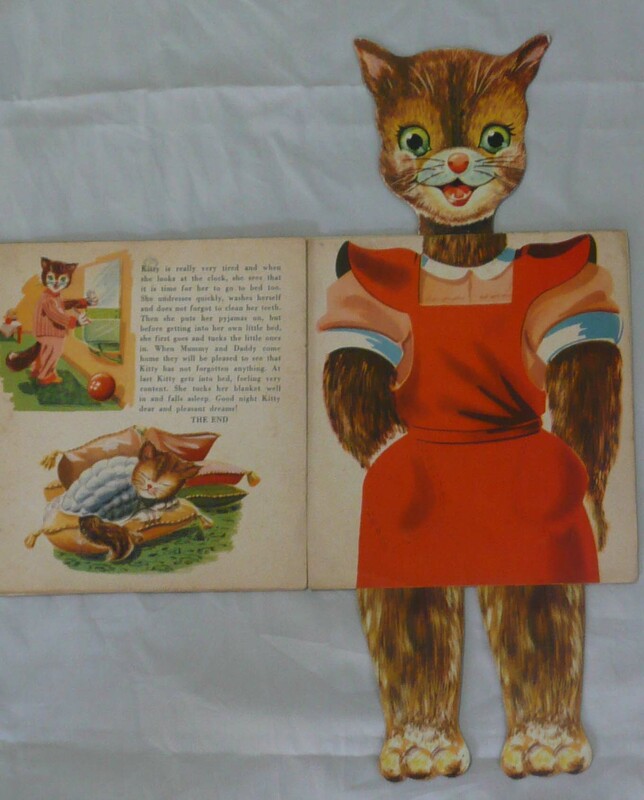 I still have some of my old books from childhood to share with my grandchildren. 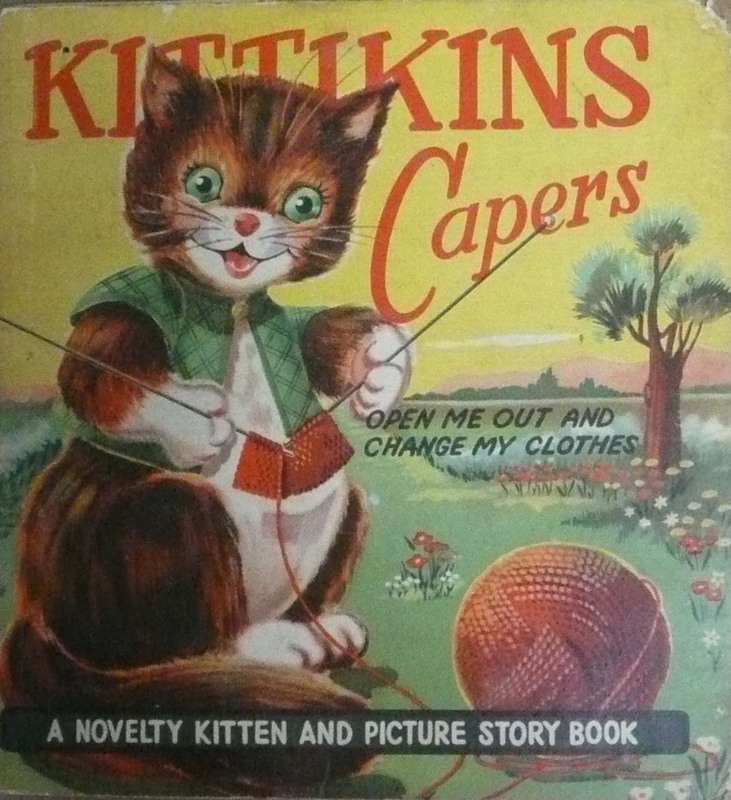 There were also quite a few books which had a fold-out element, like this one called Kittikins Capers. I think my favourite book as a child was Heidi as it combined two things: the concept of a different world far away (with snow!) and a Germanic influence which fitted with my name of origin. It seemed quite quaint for a child to be high in the mountains with only her grandfather, a friend and some goats for company. I still have the copy I was given as a child, as well as a copy on Kindle. As I grew older I also liked the Trixie Belden books and crime novels have been a consistent thread in my reading life. Mind you, I’m not often good at sussing out the baddie. However it was then, and is now, rare for me to start and book and just “give up” on it though occasionally one will be put aside for a while. None of this is to suggest that I remember all that I read –I certainly don’t, but I tell myself it’s all buried somewhere in the grey matter. I loved it when our neighbours took me to the local library, which was some distance away, and I could indulge in a much wider range of books. Then when I was I was a teenager, and at school in the city, I could join the School of Arts library in Ann St, Brisbane and uncover more books and ideas. What I didn’t know then, and probably wouldn’t have cared about given I was science-oriented, was that it “was originally known as the Servants Home which provided accomodation for single adult females who had migrated to Queensland and were awaiting employment as domestic servants”[i] something I’d like to learn more about. In the 1960s it had a very boring exterior without the wonderful lacework and verandahs and with shops at the entry. Inside it was a fabulous old library (from c1878) with a mezzanine-style gallery which ran around the walls above the main area, and ladders to get to the books. I loved it! 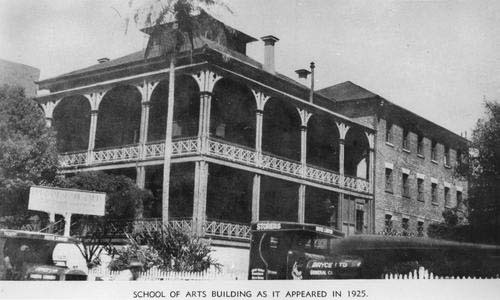 Brisbane;s School of Arts in Ann Street, circa 1925, John Oxley Library negative 202751, copyright expired. One summer I read all of the leather-bound Charles Dickens novels that my cousin was storing in my bedroom….one way to amuse oneself for six weeks. These days I like to read something that’s a bit different. I still read crime for its escapism and have a severe dose of “author-itis”, reading everything published by my favourite authors. Of course history books feature prominently in my collection these days to complement my family and local history research. While I did enjoy Kate Grenville’s The Secret River, I enjoyed the background book, Searching for the Secret River, even more. The things that struck me were the length of time and craftmanship to bring this book to birth. I’m sure most family historians could identify with the search behind the book and be amused by her protests that she wasn’t one of those grey-haired family historians (I’d provide the precise quote except that the book is currently packed away but that was the essence of it). Another book I thoroughly enjoyed was Diane Armstrong’s Voyage of Their Life, for the innovation of tracing the story of the Post-War passengers on board the SS Derna. Nothing really beats holding a book in your hand, but this year I’ve ventured into the realms of e-reading. I’ve bought a Kindle which is light-weight and long-lived, but isn’t as enjoyable to read from as my husband’s iPad which I “borrow”: perhaps part of the pleasure of the iPad is being able to see the covers in living colour, giving more a sense of reading a book. However, the sheer convenience of being able to go on holiday with a swag of books but with no additional load to carry is wonderful. It also means I don’t have that eternal compromise over bookshelf storage. A further benefit is that even if the flight is delayed you’ve still got lots to read…except in the limbo land before and during landing/takeoff. This entry was posted in 52 weeks of Personal Genealogy & History, Brisbane, Family History, Kunkel Family History, Queensland and tagged 52 weeks of personal genealogy and history, Brisbane, Heidi, Kittikins Capers, School of Arts, the Secret River, Voyage of their life by cassmob. Bookmark the permalink. There’s nothing like the smell and feel of a book especially a new one, although I am an early adopter of most technologies I am dragging the chain with e-books. Although I have Kindle and Kobo software on my tablet I have yet to download and read a e-book! Thanks for sharing your experiences; your post broought back fond memories of a subscription library at Kings Cross, NSW that I used to visit with my Mum before we moved to an area that the mobile library visited. Thanks for your feedback on this topic. Like you I love a book above all, but I have to say that you may be, well not quite, converted when you read one on your Kindle/tablet. It’s the flexibility and having multiple books with you while on the move that are the big pluses. Hi, Cass – I enjoyed reading your book recollections.